Mail-Order Mysteries by Kirk Demarais | 'TAIN'T THE MEAT… IT'S THE HUMANITY! When I was a kid one of my fondest memories of reading comics were the classified ads. Those small, poorly printed mail-order adverts promised a whole world of goodies for just 25c, 50c or a dollar. 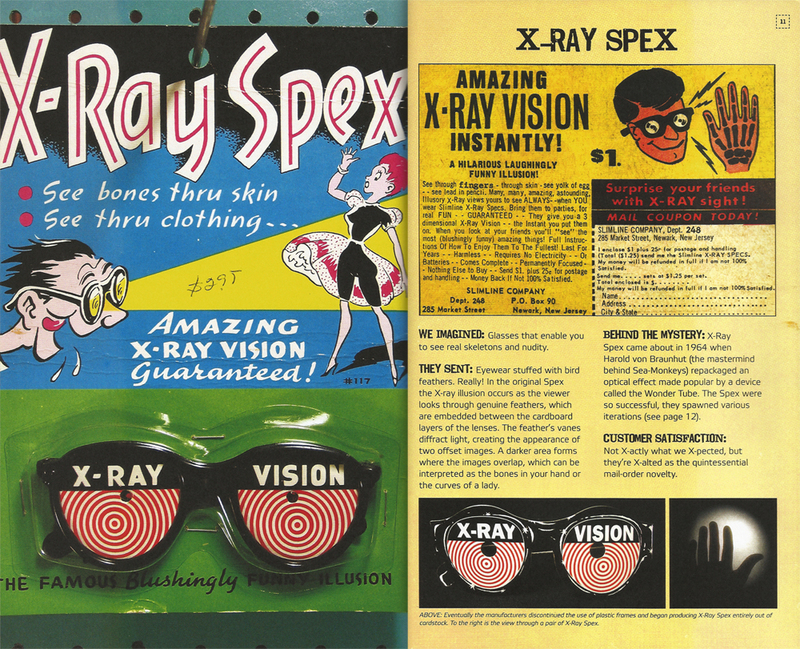 Fancy ogling girls with your very own pair of X-Ray spex? No problem. Dream of becoming a lethal black-belt? Easy. Want a seven-foot ghost to scare your friends? Who wouldn’t! Want to grow a bowl of real-life Sea Monkeys? You’d be daft not to. Those adverts were almost as much fun as the comics themselves and even though I suspected that they were probably a rip-off (but secretly wished they weren’t), that was all just part of the comic reading experience. And even if I did want to send away for one of the offers I lived in Britain and didn’t have access to any American money – so this rich world of treasure was denied me for ever. 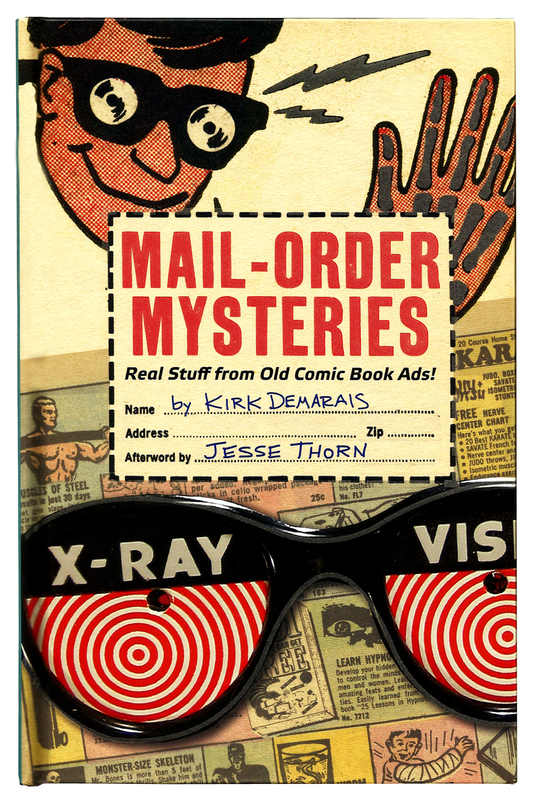 Over the years I’d all but forgotten about those ads but luckily Kirk Demarais’ Mail–Order Mysteries has brought the nostalgia for those adverts rushing back. His 160 page hardback book (which features a nifty glow-in-the-dark cover) takes a very simple idea and runs with it: he collects over a hundred of the most iconic adverts from those comics and then tracks down the items themselves to see how they compare with the ads. Unsurprisingly they don’t compare very well and that’s half the fun of the book. Those X-Ray spex were actually made of cardboard stuffed with feathers. The back-belt instructions was more notable for its ferocity (shattering your opponent’s spine will incapacitate them, apparently) than for its teaching skills. The seven-foot ghost was a large white bin-bag with a balloon for a head. 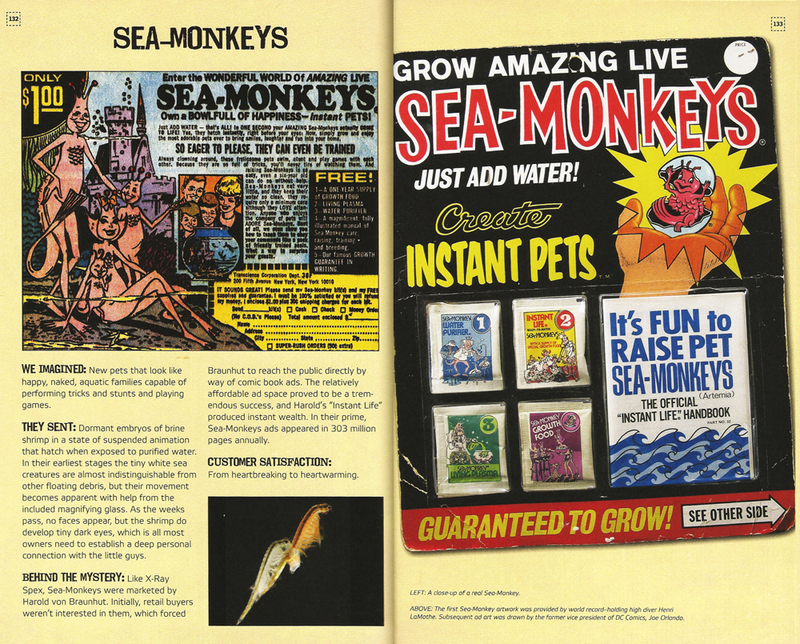 And those who sent away for Sea Monkeys (probably the most fondly remembered of all those ads) received a packet of brine shrimp. 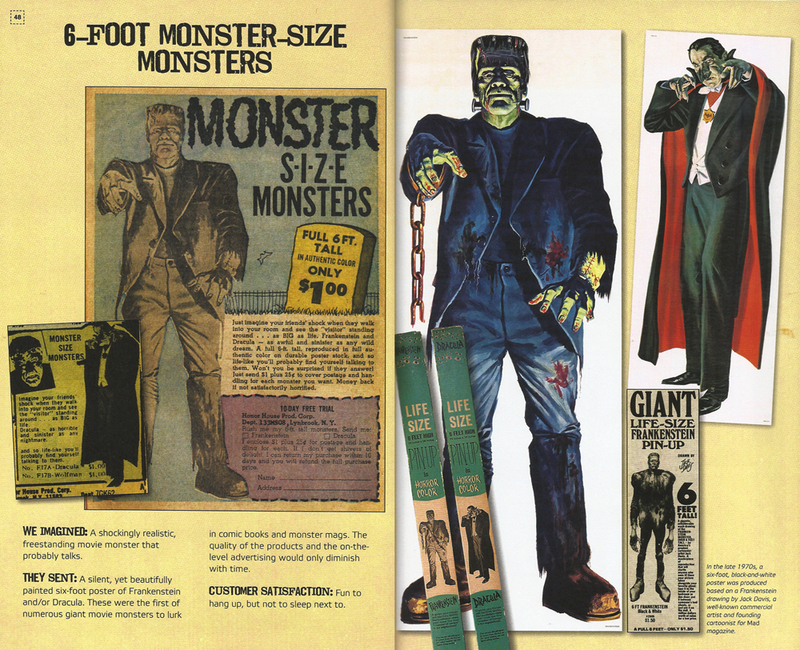 Out of all the ads reprinted in this book the only one that appeared to live up to its sales pitch was the one offering six-foot posters of Frankenstein and Dracula. It’s a pity the company that sold them is no longer trading as I wouldn’t mind sending off for them myself. Retailing for just over a tenner (or $15) Mail-Order Mysteries is an entertaining and nostalgic read; a call-back to a more naive and innocent time when, for just $6.98, you could send away for a seven-foot long Polaris submarine and expect to receive just that (made from cardboard of course). A great Christmas stocking-filler for life-long and casual comic book fans alike.